Annually elected committee members consist of Association President, Vice-President, Treasurer, Secretary, Fire Chiefs, past President, and 2 other Association members. The mission of the Auxiliary is to provide support for the Chelan District 7 Firefighters and Association and to promote community awareness in as many ways as possible through volunteering, fundraising, community outreach, and fellowship. The Auxiliary also coordinates and implements fundraisers for the Association, allowing the firefighters to keep their focus and energies on training and fire and rescue activities. The Auxiliary is open to any interested individuals who are willing to work towards these goals. Auxiliary members are encouraged, although not required, to join Chelan Fire and Rescue through simple application. The Auxiliary meets monthly at the main Chelan Fire Station on Wapato Ave E.
This committee meets to review Association Bylaws and make recommendations for bylaws updates as needs arise. All updates are presented to general Association for voting and approval. This committee has been formed to work with Chief to gather information on a timely basis relative to specific community emergency needs where Association assistance might be beneficial. Specific funds have been designated to be used by this committee for immediate relief as needed. Additional needs information is presented monthly at the general Association meeting, discussed, and any actions agreed upon my majority vote. The Emergency Assistance Committee consists of 5 volunteer Association members and the Chief. The Chelan Parade Truck is a 1958 GMC Fire Engine that was originally in service on the South Shore of Lake Chelan until the mid-90s. 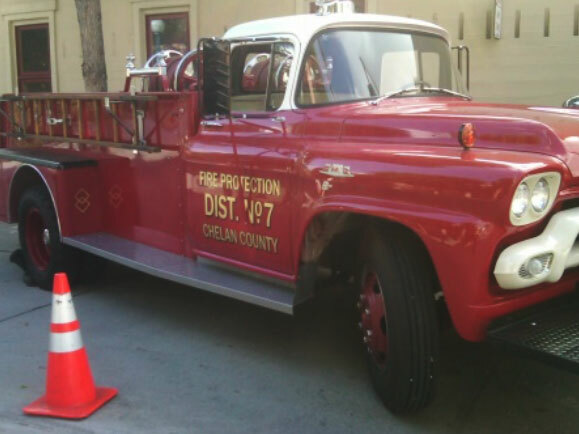 Retired by Chelan Fire and Rescue, it has been fully restored by a team of volunteer Chelan Firefighters in a major project that started in 2011. The Parade Truck was completely disassembled (including the engine), meticulously cleaned, sanded, painted and polished, re-upholstered and re-assembled by hand. A labor of love from start to finish! The restoration and maintenance is an ongoing project funded by the Firefighters Association. We proudly use it now for many community parades and events, offering rides to the delight of kids and grownups of all ages!